This meditation helps you to stay centered, relaxed and energized. Breathe into the belly, gradually opening up the palms and flexing the feet and slowly looking slightly upwards as you widen your eyes. At the end of the inbreath, continue the breath into the upper area of the lungs, so that now both the belly and chest is expanded. On the outbreath, slowly relax the palms and feet, slowly looking slightly downward, relaxing the eyes, and concentrating on your tan-tien (the area about one and a half inches below the navel, in the center of the body). Repeat four to six times. This exercise also helps cleanse you of stagnant energy. It can be done standing or sitting. At the recent push hands workshop in Connecticut the greatest problem the students had was energizing their bodies from the ground up. Since most of their attention was in their heads, their energy tended to start from there and go downward. Teaching them to “even out their attention” had a great effect, not only on their push hands, but also on their most basic feelings and attitudes. In the “evening out” exercise I point out to them where their attention is weak in terms of in front, back, at the top, bottom, to the right and left of their bodies. Then I get more specific and point out more minute areas of unevenness. Each time I point these things out, the students can clearly sense the unevenness and fairly easily rebalance their attention. But before it was pointed out to them, they didn’t notice the differences. When you are trying to “uproot” your partner in push hands to throw him off balance, your energy must come from the ground up as you breathe in. You use your whole body and your breath, while the arms and hands just serve to connect your body to the partner. You don’t actually push with your arms. Push hands trains you in the basic principles of Tai-chi-Chuan as a martial art. It also teaches you how to use your body properly in everyday life. Even more importantly, it teaches you how your body and mind may be twisted up in knots and how that affects your ability to enjoy your life and interact with other people. My approach to teaching push hands is not technique oriented. I show people what they are presently doing and ask if that makes sense in terms of what they are trying to do. Usually it doesn’t. Then I explain how the body and mind were designed to be able to perform difficult tasks with ease. If you use your body and mind as they were designed your life will be easy. It is a process of unraveling the twisted knots of body and mind to arrive at the simplest solution. One of my students said that the reason that there are no shortcuts in Tai-chi-Chuan is that the proper action is already the shortest action. A push hands player may have his hand right on the body of his partner and be in a perfect position to push. But if his mind is somewhere else, he will feel he is a mile away. We learn to align the body, the processes of the mind and align the body with the mind so that everything works together, at the same time and for the same goal in the simplest, shortest way. If you can learn to send your energy upwards and forwards from the legs and hips into the partner, not allowing the energy to escape towards the chest and head, and use the in-breath as the basis of your push, you will begin to align your actions properly. And that action will begin to transform the alignment of your body, energy and mind properly. You can think of your belly as a floodlight covered by upper and lower flaps. When they open, the light floods out and forward as you breathe in. As you breathe out, they close. As you breathe in, widen your eyes and when you breathe out relax your eyes. You can use this as a meditation. One of the greatest difficulties in learning Tai-chi is that very few people can control their muscles and joints on a fine level. Most people are awkward and are often worried about showing their awkwardness in front of other people. No worries. Everyone else is awkward too. In order to regain a complete connection between your attention and every muscle and joint of the body, we begin with Chi-gung exercises. In the case of my school, we practice “Zookinesis” (animal exercises). There is no point in learning Tai-chi forms, let alone push hands, if you are not connected to your own body. The result of this complete connection to your body is that you are able to feel the flow of momentum through your body and can make your movements smooth. You can feel the flow of internal energy (chi) through your body and let go of the ways you block that energy. This results in being able to feel life more intensely and being able to feel more joy. Then when you practice forms or push hands, you can see how your habits of tension and fear freeze parts of your body so they can’t participate in the exercise. For example in push hands, the pelvis should be relaxed so that it feels like a piece of wood floating in the ocean, bobbing with the waves. The upper body should move with the action of your partner so you don’t resist his actions. While the hips and upper body work together to neutralize your partner’s pushes, they cannot lock together. Each works in its own way and has its own qualities and yet they also work together. In fact each muscle and joint should be independent and work in its own way and yet all work together for a common goal (of neutralizing and pushing the partner). If I can get your hips to lock together with the upper body and get your upper body to lock together with your fears and habits, then I can control your movements. So you see that the ultimate goal of push hands is to free you from your fears and habits so that your body and mind can work effortlessly and efficiently. The result is that each part of your body becomes conscious and can experience joy and your life is much more fulfilling. As we begin to see plants growing and leaves emerging from trees, remember that your own body is also going through a transformation. According to Traditional Chinese Medicine (TCM) the body is an ecological system which goes through natural cycles and is affected by nature’s cycles. During the winter, the body condenses and slows. In order to emerge from this semi-hybernation we need to “clear the channels” of energy. This can be done through chi-gung exercises such as “zookinesis age reversal exercises” or massage such as “Tai-chi massage”. These healing methods “wake up” all the parts of the body, strengthen them, allow blood, lymph and intercellular fluids to flow more easily and gear up the body for a higher level of efficiency. Going directly from winter to spring without preparing your body can lead to becoming overwhelmed as the energy of nature becomes magnified. This energy penetrates and connects to your body. If your body gears up for this change, it can ulitize that energy for healing and for everyday activities. This was the secret of longevity found in ancient Chinese healing texts. If you understand how nature works and live your life accordingly, then you will always be healthy. So do your zookinesis or other chi-gung, practice your Tai-chi forms and/or get a good Tai-chi massage. This may be the best spring you ever had! This exercise will increase the flow of blood and lymph in the body, improve breathing, increase energy levels and make your body more flexible. Stand with your feet shoulder width apart and the knees slightly bent. Imagine a line connecting your right shoulder to your left hip. Relax the right shoulder so that it sinks towards the left hip along that diagonal line. As the shoulder sinks in this way, breathe out. Then stretch the shoulder back up to its original position and a little beyond as you breathe in. Do the same with the left shoulder and the right hip. Four repetitions each would be fine. Next, sink your lower ribs into your lower back as if the front of the lower ribs were sitting on the lower back, and breathe out. Then raise your lower ribs forward and up as you breathe in. Again, use four repetitions. Sink the sternum into the mid back as if it was sitting in an old chair and breathe out. Lift the sternum forward and up as you breathe in. Four repetitions. Lift the left side of the ribs to the left and then up as your body bends slightly to the right and you breathe in. Then let the ribs settle back to the center as you breathe out. Do the same for the right side. Four repetitions per side. Stretch your neck forward (breathe in) and then relax (breathe out). Stretch your neck to the rear and then relax. Stretch your neck to the left and then relax. Stretch your neck to the right and then relax (with the same breathing each time). Do forward, back, left and right and repeat the sequence four times. This is a basic Zookinesis series. Zookinesis (animal exercises) is a system of chi-gung. This sequence can be done once per day or as needed. In just a few days you should feel a whole lot more relaxed and have steadier energy throughout the day. Feel free to comment on your results in the comments section. In traditional Chinese medicine the body is considered an ecological system which functions in a similar way to a forest or other natural area. In the winter life condenses and in the spring it blossoms, becoming more and more vibrant into the summer. In modern times we control our environment so that the body is not subject to these variations. But there are so many cues for our body, connecting it to the rhythms of the seasons, that its chemistry, its behavior and its growth cannot really be disconnected from nature. We disregard these cycles in our daily lives while our bodies and even our minds and emotions struggle to maintain the cycles. The result is a biological battle within us that wears us out and dulls our minds. It is helpful to remember the changes of the seasons and to understand what mode your biological being is in. That is one of the reasons all cultures have holiday ceremonies at each change of the season. In the spring for example it is very healthy to spend even a few minutes outdoors each day, breathing in the air, absorbing the sun and feeling the “mood” of the season. This allows your “insides” to coordinate their rhythms with the “outside”. It is a very natural form of meditation. You will find the feeling of battle is replaced by the feeling of healing. Even a storm deserves to be observed and “felt”. When you travel in a plane you must yawn every few thousand feet to even out the pressure inside and outside the ear, otherwise your ear would experience too much pressure. Spending some time in meditation of the change of seasons does the same on a different level. You will be amazed at how much better you will feel! Be your own healer. 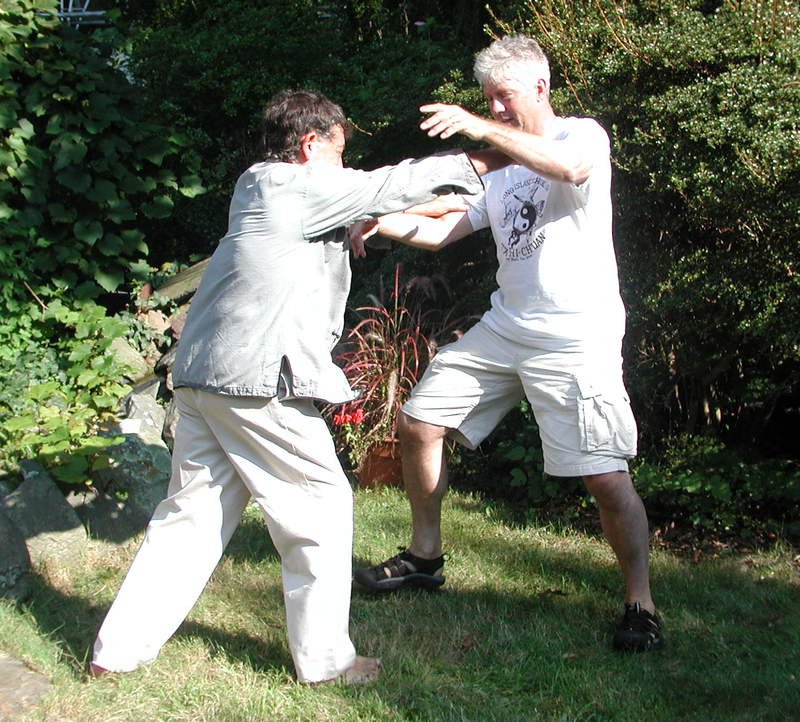 The movements of Tai-chi encode lessons of how to bring power back into the body. Each principle of movement is like the chapter of a book, explaining how to keep the body young and the mind creative. A teacher must explain how to read this movement book so the student can discover its secrets. The most striking feature of Tai-chi forms is the smoothness of movement – an unbroken, even current, ebbing and flowing. In order to achieve this movement, the mind must also flow smoothly, rather than jump from one point to another. In this way mind, rather than being at one point at one time, must expand, filling up the whole space within and surrounding the body. As you breathe out, you sink into the ground, and as you breathe in you rise up. Each joint relaxes as you sink. Each joint expands as you rise in a sequence. There is a corresponding effect on the mind (attention). Your attention flows downward as you breathe out, following the momentum as it sinks into the earth. Your attention expands upwards as you breathe in, following the momentum as it flows upward and outward. Let’s just take these dynamics of movement and attention and understand what information is being conveyed that may help us to improve our lives. Too often our attention gets caught up in the specifics of what we are doing and we forget our overall goals in life. Our attention becomes like a pinpoint – one dimensional. We need to be aware of the totality of our lives – what we have been trying to achieve, what skills we have gained, lessons learned and how we can continue to be creative with our lives. Otherwise our minds will be in a bus someone else is driving. If our bodies are smoothly flowing and cannot be jerked about by our own patterns of thoughts and tension, then surely our attention cannot be jerked around by the forces around us. When the news tells us that what is going on is that one group is fighting another, the news is creating an agenda in our lives. It tells us what we should be paying attention to. The news is driving our bus. The Tai-chi student learns that the conflicts we see or read about in the world around us, superimpose themselves inside of us, so that our minds are filled with conflict. The mind and body seem to be in conflict as the mind tries to make the body do what it wants (and usually fails). Our relationships and everyday lives seem to consist of one conflict after another. At a certain point in our training it becomes obvious that we have adopted the mode of conflict we see around us into the very essence of who we are. But what would it be like if conflict was not the basis of every level of our lives? It would be like the Tai-chi form. This form is a movement code for a harmonious mind and body, a harmonious human being living a natural way of life. Indeed if the form were done with conflict, with tension, with jerkiness, it would not really be Tai-chi. So the smoothness of the form tells us to look at nature for flowing harmony and let nature control your bus. Just as our attention flows into the earth and sky with our breath, you can also control whether your attention moves to conflict or to harmony. In this way you learn to drive your own bus. You learn to become the harmony that others can learn from. By expanding your attention so that it fills your whole body and surroundings, you learn that your surroundings are really part of you. Your sense of identity moves from a set of opinions and a pattern of emotions to a whole living body and vibrant, creative awareness. From there, it expands to your natural environment, your community and to all life. At that point, conflict is hardly possible. You had to be convinced that you are completely separate from nature and from other people in order to be trained into a life of conflict. When you cast that illusion aside your life regains its natural power. Even your past and present seem to unite as you remember how the dreams and hopes of childhood gave you enthusiasm for life. That enthusiasm still lives inside and can return home. When you forget your dreams, you lose your power. They tug at you when you sleep, fighting their way up through the layers of conflict that have pressed them down. When conflict no longer tears you apart, when your dreams of power become part of your life, then you physically experience your connection to the biological aliveness and consciousness of the world you live in. The shell that seemed to contain you dissolves and permeates into the world around you. You have come home to that world, you are well known in that world, and you are loved by that world. It may seem that we have lost the power to improve our lives in these tough economic times. Many people have heard that Tai-chi and Zookinesis help you develop more power in your life. This training was developed at a time when everyday life was hard, without the benefit of modern conveniences. It developed the strength and power within an individual so he could be more powerful in his everyday life. Yet the teachings seem mysterious to us in modern times because we have a different understanding of what power means. We think of power as just earning more money, controlling the behavior of others or developing larger muscles. When a potential student hears that Tai-chi teaches you to develop internal energy (“chi”), he immediately thinks of science fiction stories of shooting rays of energy to conquer enemies. We take very sophisticated ancient training and make them seem silly. The term “internal energy” refers to the way that what is going on inside of you influences what happens in your life. It means that your state of health and emotional balance is the most important influence on your power to improve your life. I show below a way of explaining this that I use in my classes. It hopefully retains the flavor of the ancient way of writing while making the principles described above, understandable to our modern minds. Some students want to learn to concentrate and direct their energy. I teach them to release their energy and let it go where it wants. The students wants to gain power. I teach them to stop interfering with their natural power. Some want to win the heart of a lover. I teach them to release their heart and let it go where it wants. Some want to live in a beautiful house. I teach them to become alive in their bodies. When you are alive and vibrant, your consciousness seeks to expand and to connect with the world around you, and so you live in the world, and are alive in the world. It is your living energy, merged with the world around you that makes that world beautiful. When you withdraw your feelings from the world around you, the world itself feels dead. When you withdraw your feelings from your body, your body feels dead. Your life then becomes divided, one part withdrawing, and the other part wanting to be released so it can join the world. You then seek to acquire things of the world. In this way you can remain separated from it, yet claim ownership over part of it. Owning something takes the place of really being part of it. Your relationships with people are no longer based on releasing yourself to the other, and receiving them, but rather on agreements and arrangements. You originally withdrew to protect yourself from the unpredictable behaviors and intentions of others, yet wound up damaging yourself by being disconnected from the vibrancy of life. Tai-chi and Zookinesis teach us that the state of withdrawal is so prevalent in our society (and in many others past and present), that we have forgotten how it feels to be connected. Some of us have even forgotten how to let another person completely into our souls. We have “hesitant” relationships. Tai-chi and Zookinesis teach the art of “letting go” (releasing). At a certain point you feel the flow of energy within the body. You realize that you are “holding” that energy, or we say, “locking it up”. Even our attention (consciousness) seems to be locked into patterns of thinking. At another point in the training, that energy suddenly “jumps the fence” and seeks to merge with your surroundings. It is a startling moment because you realize how much “locking up” the energy has hurt you previously. Your consciousness now joins the “consciousness of nature” just as the water of a stream joins the water of a river and then the water of the ocean. You feel a member of life. Your thinking and behaviors are no longer so patterned, but are more creative. Once your consciousness fills your body and the world around you, your life is felt more intensely. Every cell of your body is like the string of a stringed instrument, which is played by the beauty of the world around you. Your attention is attracted to beautiful things and thoughts rather than to worries and anger, and so your life goes in a new direction. This is all accomplished by learning how to release your energy (“chi”) and consciousness and let it go where it wants. You will feel like you were a caged animal that has now been let loose into its natural habitat. The cage of fear is no longer your home. I have a rabbit who lives in a cage in the house during the winter. When I let it loose from time to time, it seeks the “shelter” of a stool I use to hold a plant. The rabbit stays within the four feet of the stool. It has been let loose yet seeks the security of something that looks like his cage. When the student’s energies have finally been released, there is a tendency to seek a new “cage”. He seeks philosophies and “truths”. Tai-chi is not really a system of truths. It is a way to become re-connected to nature and to other people. It is a simple, practical teaching that does not get involved in abstract philosophy. The goal is to understand yourself – to see yourself. There is a saying, “See yourself, be yourself, appreciate yourself.” See all your patterns and see your creativity. Don’t try to twist yourself into someone who is “approved of” and turn into a fake version of yourself. And then appreciate all the efforts you have made in your life to survive in this world, to understand the world and to be creative in the world. Appreciate your biological aliveness and how you are connected to nature. Appreciate the creative efforts of others and be sympathetic to their lack of perfection (as well as to your own). Understand that other philosophies are also a way of understanding yourself and releasing you from self-imposed prisons. Don’t seek them as the security of yet another cage. Seek nature in your surroundings and in people. Step out of your own way so that the now invisible world of creative energy can be perceived. Let that be your new home. Remember that nature is creative. Nature is vibrant. Tai-chi also teaches that nature is conscious. The qualities that you seek for yourself are already in you because you arose from nature. When you release your energy, your attention, to nature, you enter the flow of creativity, vibrancy and consciousness. As much as you release, that much and more flows back. So the teaching of “letting go” is the path to power. One of the primary effects of Tai-chi and Zookinesis practice is to keep the body and mind young. The basic principle about how this can be accomplished is the balance of Yin/Yang energy in young vs. older people. When a baby is born, according to these principles, it is all Yang energy (expansive). As you get older you become more Yin (compressed). Your body shrinks and your mind becomes more rigid. The body and mind are most powerful when the expansive energy (Yang) exactly balances the compressive energy (Yin). As an example, if a joint gets injured and the ligaments, tendons and muscles around that joint are damaged, the body starts healing. If you just sit around and don’t move the joint a little, the repair job will be affected by the immobility of the joint. The repair will be compressive, which means that you will have little flexibility. This is why physical therapy is needed, partially to stretch the muscles and connective tissues around the joint so you will maintain flexibility. When you stretch and use the joint, your body then knows how that joint is to be used and it repairs the joint with that “in mind”. I healed a torn knee this way, without surgery. Tai-chi theory explains that the body does, in fact, have a mind (Body-Mind), which is aware of what needs to be done and intelligently adapts the repair to the needs of that part of the body. Stretching and using the joint would be considered Yang, while giving the joint adequate rest would be Yin. You need a balance for a good repair. There is another factor for the repair job to come out right. Children, as noted above, are more Yang than adults (in general). They will run around without worrying about the possibility of injury. They love to move and use up energy, while adults like to sit and talk (in general). If your body is repairing an injury and you are the type of person who doesn’t do much and doesn’t have much to look forward to doing after you get better, then your injury may not heal as well. We all know about athletes who get injured on a regular basis and have many surgeries. They want to get back into the game as soon as possible. This Yang attitude helps their recovery. They can’t wait to get better. The Yang attitude of mind helps physical recovery. On the other hand, if they cut their recovery short and go back to the game too soon, they can re-injure themselves. So again, a balance of Yin and Yang attitude is essential. Somehow I don’t think that monkey spent much of his time whining about his physical condition. I resolved back then to always remember that monkey if I ever started whining about anything. Another story: A researcher had just come back from Ecuador where he met a man who kept marine iguanas as pets. They were housed in a fenced in area in his back yard. At that time, and even today I believe, zoos were not able to keep marine iguanas alive in captivity. So the researcher was sent to find out this man’s secret. What did he feed the iguanas (which normally eat algae on rocks under the water)? He fed them scraps from his table along with scraps of vegetables he got free from the local market. “But this is not the natural food for marine iguanas!” complained the researcher. The man explained that he loved his iguanas and they loved him. They were very happy. So it didn’t matter what they ate, as long as they were happy. Food going into a happy iguana, he explained, turns into a healthy iguana. The point of all this is that an iguana or a person who looks forward to and is excited by each day is in a healthy state of being. A person who whines and worries about each day is in an unhealthy state of being. The excitement of life adds Yang energy, which can compensate for the tendency to become more and more Yin as you get older. In the Tai-chi practice of Push Hands, this principle goes one step further. (In Push Hands, two people stand facing each other and try to throw each other off balance). There is a tendency to tense up (to condense) when trying to push the partner. That tension makes you rigid and your partner can use your rigidity to actually push you over instead. So you are taught to relax your back and let it sink into the ground. This relaxation and grounding then sends energy upward and forward, pushing the partner over without needing to tense up. You are using relaxation to generate force. The principle here is turning Yin energy (relaxation) into Yang energy (the release of your energy upward and forward). You are transforming Yin into Yang. When your partner pushes you, you take that Yang energy and sink it downward into your “root” and compressing your legs. You have turned his Yang energy into your Yin energy (compressed legs which is potential energy). As you are grounding his Yang energy, you are sinking your back into your root again and then pushing him with your own Yang energy plus his Yang energy which you stored in your compressed legs. And so Push Hands is the art of transforming Yin and Yang energy in a continuous flow of motion until one person gets the upper hand due to greater skill (not due to greater strength). You learn to balance and use Yin and Yang so the body stays relaxed yet powerful. This keeps both the body and mind young. In everyday life you can stop for a moment to assess your balance of Yin and Yang. Do you feel your body and mind compressing or expanding too much? You will learn to develop a balance that will keep you healthier and younger. You may say, “What if I don’t have anything to look forward to?” This reminds me of an experience I had when in nursery school. I was always happy. A girl came over to me and asked, “Why are you so happy?” I couldn’t figure out why I was happy, so from that time on, I wasn’t happy anymore. My state of unhappiness led my mind to contemplate unhappy things so as to explain why I was now not happy. It took many years to remember that turn in the road that led me in the unhappy direction. Tai-chi training taught me the relationship between mind and body. That relationship is more “me” than either one alone. Identifying with the balance of mind and body then allows you to enter into a balanced relationship with your environment. By starting with balancing Yin and Yang energy in your life, you are led to the balance of mind and body and then to the balance of yourself with your environment. This is truly the basis of health and keeping young. Copyright © HEALING AND MARTIAL ARTS BLOG. Valid XHTML 1.1 and CSS 3. Designed by page, Powered by WordPress.